Diamond mining stocks have taken a beating in recent years, with most believing there is no end in sight. Post-financial crisis oversupply and rising concerns about the assumed influence of laboratory-grown diamonds have tested the patience and tainted the sentiment of investors in the diamond arena. But the imminent shrinkage of supply and continuing demand for the product is not imaginary. Those who doubt the resilience of the diamond industry and have given up on its ming sector may regret selling low. 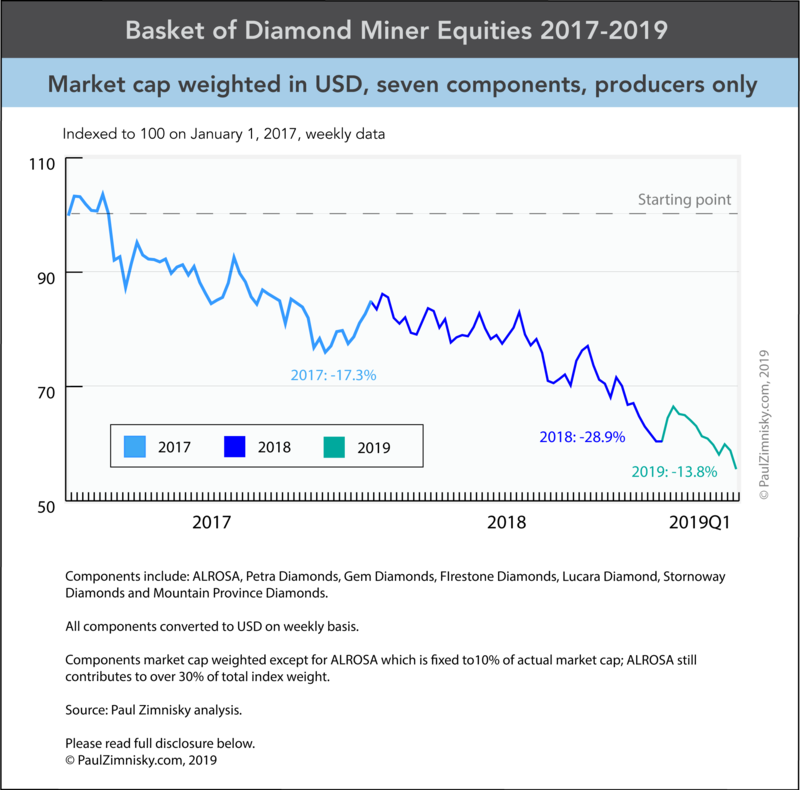 In his latest contribution, "Investor Sentiment in Diamond Mining Stocks Makes for a Contrarian Play", independent diamond industry analyst Paul Zimnisky goes against the grain. Republished in full from Paul Zimnisky's Diamond Analytics with the analyst's generous permission, we present his contrarian view of diamond investing. Three days later, on a Mountain Province Diamonds (TSX: MPVD) analyst call following the company’s full-year 2018 results, a portfolio manager posed more of a statement than a question in the Q&A portion of the call starkly reflecting a wider sentiment of institutional investors’ view of the diamond mining industry at the moment. While frustration such as this is understandable for any investor that has had exposure to the space in recent years given the utter underperformance (see graph) - diamond mining stocks have felt like a vortex that takes your money and does not give it back. However, it appears that sentiment has reached a level implying that the independent diamond mining industry will not survive, which is seemingly a stretch too far. Yes, lab-created diamonds will inevitably take some market share from natural diamonds, especially at the lower price points, just as moissanite and cubic zirconia did, however, the extent is yet to be determined and will most likely depend on the success of marketing by not just the lab-created industry, but also the natural industry, which has a very resilient history. Historically, natural diamonds have been the envy of the luxury industry: the penetration of diamonds is unmatched, it is the one luxury item that most women (in America at least) will be gifted in their lifetime. However, maintaining such an overwhelming market position is almost as difficult as building it, especially in the post-De Beers monopoly era with the absence of “A Diamond is Forever” campaign. 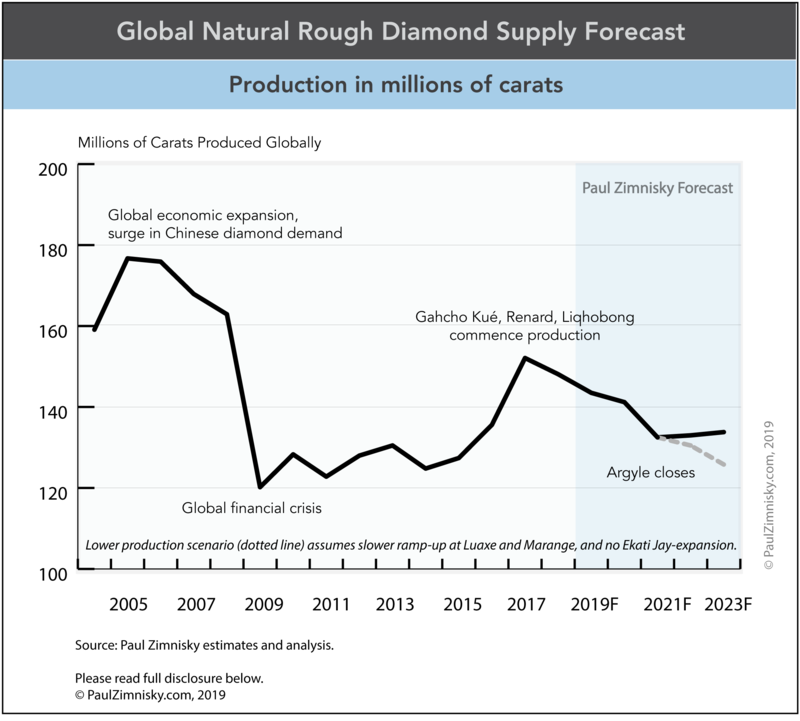 Natural diamond supply is estimated to come off this year and continue to incrementally decline through at least 2021 (see graph), which should be supportive of diamond prices and thus miners. Weaker prices over the last five-plus years have led to a natural paring down of supply which is approaching more normalized levels after reaching a post-global-financial-crisis high in 2017. Also worthy of note, a significant amount of a multi-year inventory-deleveraging in the Indian midstream sector has already taken place and inventories there are also approaching a more normal level. In addition, despite various global macro-economic concerns, global demand for natural diamonds appears to be relatively stable at the moment. The largest jeweler in the world, Tiffany & Co. (NYSE: TIF), has guided sales increasing at a “low-single-digit percentage” in the 12 months ending January 31, 2020. Importantly, Tiffany does not offer lab-created diamonds. Further, the largest jeweler in Greater China, Chow Tai Fook (HK: 1929), opened a record number of new stores in the most recent fiscal year ended March 31, 2018, an undeniable bid of confidence in the growth potential of that market. Chow Tai Fook does not offer lab-created diamonds either. While investor sentiment is what drives equity valuations, reflected by the “P” of the proverbial P/E ratio, or price-earnings multiple, the “E” is the portion of the equation ultimately driven by price fundamentals and operations which the industry poses control of. Seemingly stable global demand for natural diamonds and an apparently favorable supply picture should be supportive of diamond prices and the companies producing them, especially those with de-risked mining operations and a manageable debt load.